Quick and Easy Strawberry Pineapple Fluff Salad recipe is perfect for holidays or any other special occasion. 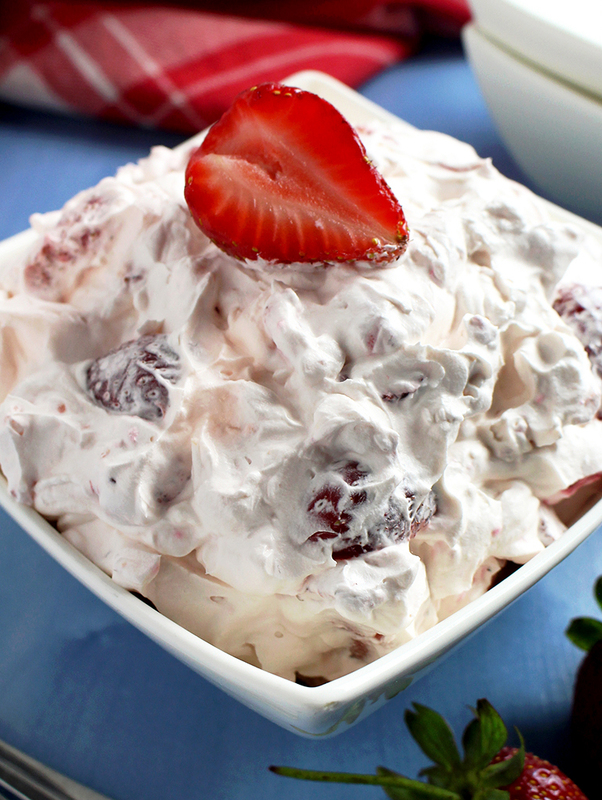 This strawberry marshmallows salad is really something special! It’s so simple to make and yet tastes amazing! I served this weekend for our friends and it was a huge hit! My son tried to hide under the table..
Magic moments are truly come. Mouth-watering salad is on our menu today. 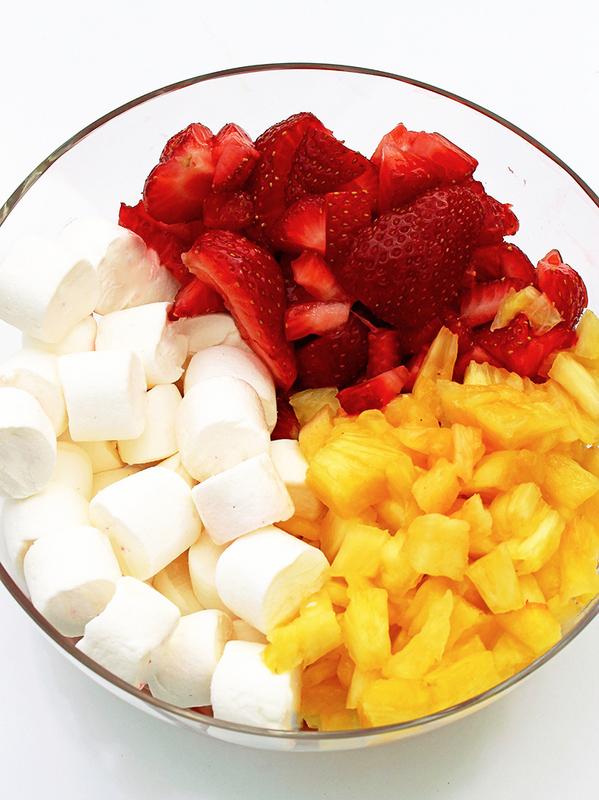 So take your positions and enjoy in this Strawberry Pineapple Fluff Salad. You can take a look our most popular salad recipes Cranberry Pecan Spinach Salad and Strawberry Spinach Almond Salad. What do you need to make this Strawberry Pineapple Fluff Salad? How to prepare Strawberry Pineapple Salad? Finely chop and squeeze the pineapple. Combine chopped strawberries, drained pineapple and sugar and let stand in fridge for about 30 minutes. In small bowl firmly whisk whipping cream and add vanilla extract and mini marshmallow. Finally, mix with fruit until well combined. Refrigerate and allow to stand overnight for flavors to develop. 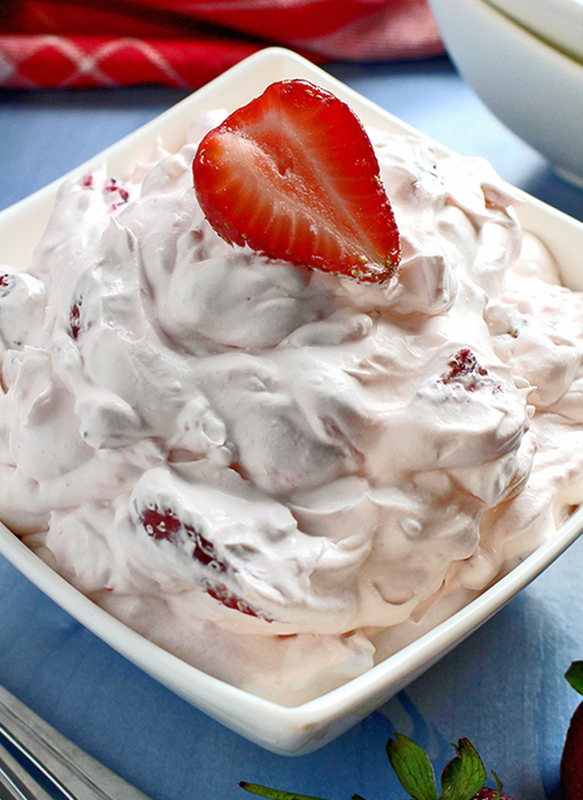 Decorate with fresh strawberry, before serving. This creamy pink color of the salad is just too much to resist, with crushed pineapples and sweet marshmallows hidden inside. This cool, shimmering fresh salad makes a wonderful all seasons, so hard to resist, dessert. I remember eating it as a child! It’s one of my husband’s favorites desserts. Absolutely amazing, I am a huge fan of strawberries. This creamy pink color of the salad is just too much to resist, with crushed pineapples and sweet marshmallows hidden inside. This cool and fresh salad makes a wonderful all seasons, so hard to resist, dessert! Thanks a lot, Gwen! Glad you like it ? I did’t made on that way, so I’m not sure. You could use bananas, but there are different kinds of apples, so I’m not sure about the taste of final mixture.